To follow up collaboration within Watershare® Pieter Stuyfzand and Gerard van den Berg of KWR visited the Korea Institute of Science and Technology (KIST) in Seoul. March 22 KWR participated in a dedicated workshop on aquifer storage and recovery (ASR) application in saline aquifers. Here, the possible Fe release by microbe-mediated reduction and the high resolution density-driven flow and transport modelling in a large scale ASR pilot at the delta area of Nakdong River located in southeastern part of Korea, were presented by KIST researchers Seunghak Lee and Peter Kyungchul Kang. Hydrogeochemical issues during different ASR applications were elaborated by Pieter Stuyfzand. The European funded SUBSOL project on subsurface water solutions in coastal areas was presented by Gerard van den Berg. 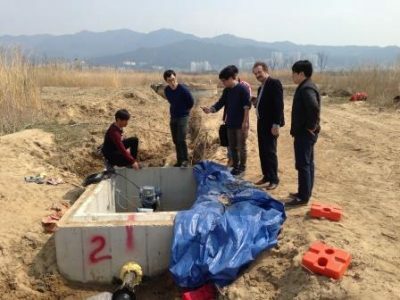 A visit to the ASR pilot site near the City of Busan took place on the 23rd of March. The infrastructure at the site is presently being installed and the system is already partly active. Infiltration water at the site has two sources, direct river intake and river bank filtrate from the Nakdong River. This water is continuously infiltrated in the subsurface and recovered by a separate set of wells. The Korean project is a unique collaboration between KIST, universities and companies working for the Korean Ministry of Land, Infrastructure and Transport. Prof Namsik Park of Subsurface Reservoir Research Center of Dong-A University is one of the main contributors to the pilot. This pilot is important to gain further practical expertise on groundwater abstraction and associated hydrogeological and hydrogeochemical processes. From a scientific viewpoint, the Korean pilot is particularly interesting because of freshwater infiltration in a saline aquifer. This differs considerably from most other running coastal ASR pilots, such as those studied within SUBSOL, where freshwater is infiltrated in brackish aquifers. The visit is the start of an active collaboration between KIST and KWR in the field of ASR application in saline environments. Dr. Seockheon Lee, head of the Center for Water Resource Cycle Research at KIST acknowledged the ongoing international collaboration within Watershare® and specifically addressed the well elaborated expertise of KWR in the field of ASR and hydrogeochemical processes and modelling. KIST will be actively involved in the SUBSOL project as associate partner. We agreed also that Pieter Stuyfzand will play a role as independent expert for the ASR pilot in Korea.